Seven billion humans presently inhabit this shrinking world. In less than a lifetime there will be twice as many. The information we generate now doubles every few months, with the rates of crime, noise, and environmental damage not far behind. Facing these enormous forces, who is not increasingly pressured, even overwhelmed? But an astounding solution is on its way. Already, 500,000 children owe their unprecedented cognitive, social, and creative powers to the vision of one person. 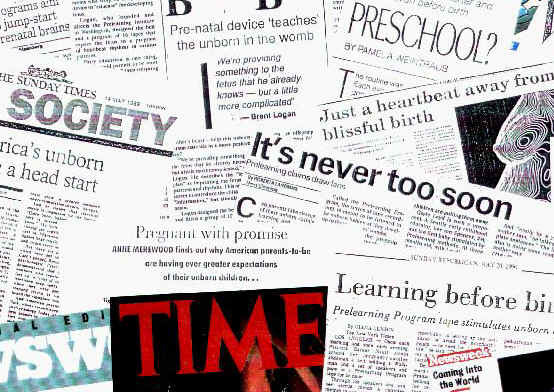 The foremost media--CNN, ABC, CBS, NBC, Fox, TLC, NPR, CBC, BBC, Time, Vogue, Atlantic, New York Times, Washington Post, Wall Street Journal, London Times, and hundreds of other sources--have reported his breakthrough findings to a fascinated audience exceeding 500 million; his prenatal enrichment technology, BabyPlus, is distributed in 60 countries. Executive Woman of London calls him "a leading and revered expert in his field." Neurogenetic researcher, developmental theoretician, inventor, philosopher, novelist, poet, artist, lecturer--few innovators have approached the imaginative yet pragmatic efforts of BRENT LOGAN. As highlighted in this website, his theories and projects are shaping the new millennium with dramatic effect.